Having an unhealthy obsession with volumetric pixel art and old-school Zelda games isn’t really necessary to be excited about 3D Dot Game Heroes, but it sure helps. 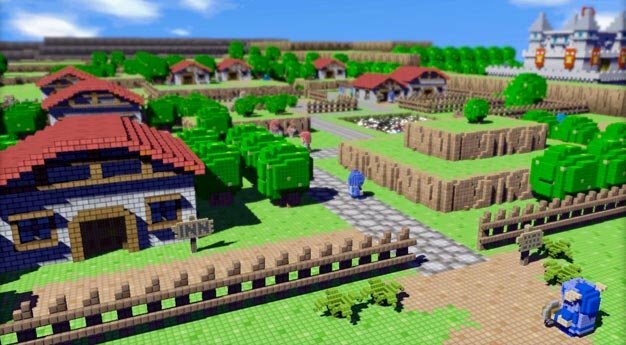 Publisher Atlus has revealed that they will be bringing From Software’s blocky homage to the 8-bit RPGs of yore to North America this Spring. In addition to making a lot of fans extremely happy, Atlus’ PR department continues to establish its esteemed public image with the following statement. “The 8- and 16-bit classics many gamers cut their teeth on are magical, down to their blocky sprites and elegantly simple gameplay,” mused Aram Jabbari, Manager of PR and Sales for Atlus, while twirling his rattail and wearing a poorly coordinated denim-on-denim outfit. “3D Dot Game Heroes captures all of that legendary charm and more, bringing classic visuals, familiar sounds, and a grand sense of exploration and discovery into stunning next-gen realization, all the while giving countless winks and nudges to the fans those iconic games mean the most to. This is pure action-adventure gaming at its finest, a true love-letter to a time-honored genre,” he added while putting baseball cards in the spokes of his 10-speed. North American retro fetishists can look forward to all this when the PS3 game releases stateside on May 11th, 2010 for a modest sum of $39.99.